GEORGETOWN, Guyana, Nov 17, CMC – Imagine relocating the entire population of your country in the face of a colossal hurricane and two months later still not being able to get back home. Now imagine spending several nights in a shelter and taking a stroll the next morning only to find what you used to call community, city or country reduced to an apocalyptic scene. The principal economic sectors of tourism and agriculture have been very significantly affected, the resulting loss of jobs compounding the anguish of the loss of homes. In-depth damage assessments in Barbuda and Dominica are still on going, but initial estimates indicate recovery costs could be more than three billion US dollars. 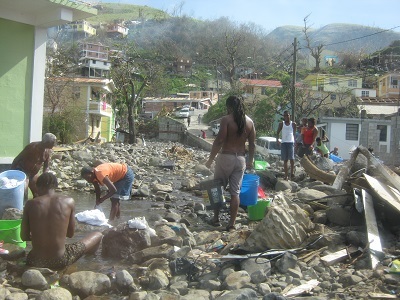 Since the hurricanes hit, the governments of Antigua and Barbuda and the Dominica along with the Barbados-based Caribbean Disaster Emergency Management Agency (CDEMA) have been working on the ground hand-in-hand with UN teams, co-led by the UN Development Programme (UNDP) and the UN Office for the Coordination of Humanitarian Affairs (UNOCHA) with an urgent task. Also on the front line have been other CARICOM member states and specialised Institutions, France and its departments in the Caribbean, Venezuela, the United Kingdom, the United States and the International Committee of the Red Cross. Women and men are working around the clock to build back better. They need more resilient communities that are ready to cope with the next hurricane season only seven months ahead. The needs are urgent. But there are three crucial opportunities at hand. First, the Conference of The Parties (COP23) in Bonn, Germany, 6-17 November, is a vital moment for the world to come together and act on climate change. Then, on 21 November at the UN headquarters in New York a UN-CARICOM pledging conference provides the opportunity for the world to support affected Caribbean countries as they build back better, especially considering that they have been bearing the brunt of climate change without having contributed to the problem. Finally, now, more than ever, it is fundamental that the international community rethinks traditional criteria for concessional development financing based primarily on GDP per capita. These affected nations are being denied full access to such financing based on being ranked as Middle Income countries. The criteria must take into account the economic and environmental vulnerability of SIDS. Pete Buttigieg campaigns in Marshalltown, IA: "It's very clear that the current tax law was not really designed with the interests of most Americans, or fairness in mind... It seemed to be about comforting the comfortable and didn't do much other than afflict the afflicted."